Author Written by Suruthi G. and last updated on Posted on November 7, 2017 . 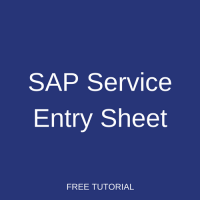 This tutorial is part of our SAP MM course and it talks about SAP Service Entry Sheet. We assume that you are familiar with purchase requisition, purchase order, goods receipt, quality inspection for stock materials in SAP. If not, please check the tutorials that explain these topics. This tutorial will help you understand external services management, SAP service entry sheet, and differences between procurement of stock materials and services. SAP service master record is master data which aids in time reduction and error occurrence. To uniquely describe any external service, a service master record consists of the following information: service / activity number, service category, descriptive texts, base unit of measure, material / service group, and valuation class. We also have a separate tutorial on SAP Service Master. When you procure a stock material, material number plays a vital role. It uniquely identifies a material to be procured and stocked in a warehouse. Similarly an activity number is used to uniquely identify an external service that is to be rendered. This activity number could be defined both internally and externally. To serve this purpose number ranges could be configured accordingly in customizing. Similar to material type functionality for materials, the service category is for services. This category helps to identify the types of services. The different types of services could be configured in customizing. This field helps in grouping purposes, to group together material or services and then the same would be assigned to a material group. This field is the same field that is used in material master. Whenever a service is entered, this field aids in identifying the G/L accounts that are updated. Let us create a service master record now for our business scenario of relocating office. 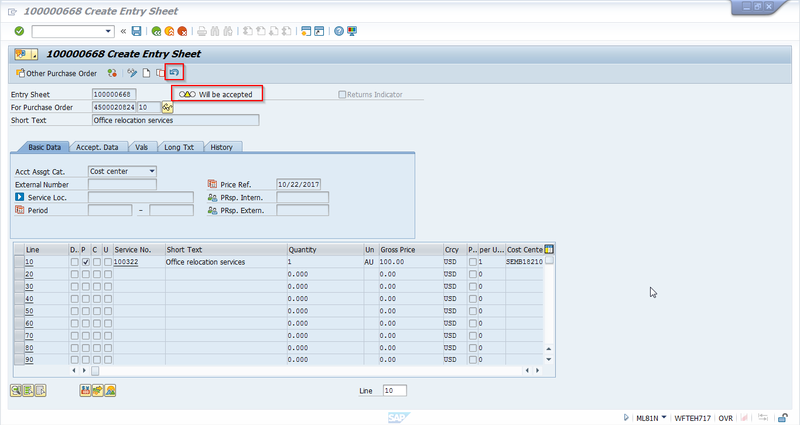 Follow the SAP easy access menu to create a service master record. Transaction AC03 is a single screen transaction, which handles all creation, change and display of service master records. The above picture with activity number 100322 is in display mode. This service master record was created and display mode is shown for explanation purpose. External services from a service provider would be agreed upon certain price and for a certain period of time. These prices that are valid over a period can be maintained in SAP as service conditions. Some conditions which are agreed later or for any unplanned services could be maintained in purchasing document. 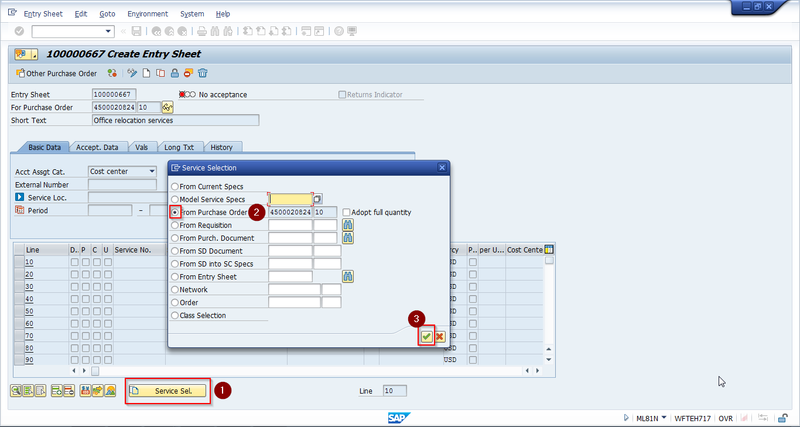 We also have a separate tutorial on SAP Service Conditions. Service conditions are maintained for services, vendor, purchasing organization and plant for service/activity number 100322 – office relocation services. For better understanding of service PO, let us compare stock PO and service PO. For material procurement, we would need material number and relevant data for each item. In contrast, for a service PO, only short text is required at the item level. The individual tasks / services are maintained at item detail level in the service specifications along with description, quantity, price and other required details. Let us create a purchase order for office relocation services. As you could see in the above figure, item category for service PO is “D”. Item category D triggers the service functionality and helps us to create service specifications and value limits for unplanned services if any. Account assignment category is “K” referencing a cost center to which postings should be made. Account assignment category “U” is allowed for a service PO as we might not be sure about it during PO creation. Short text would need to be entered. Once short text is entered Material group details are pulled from the service master record. 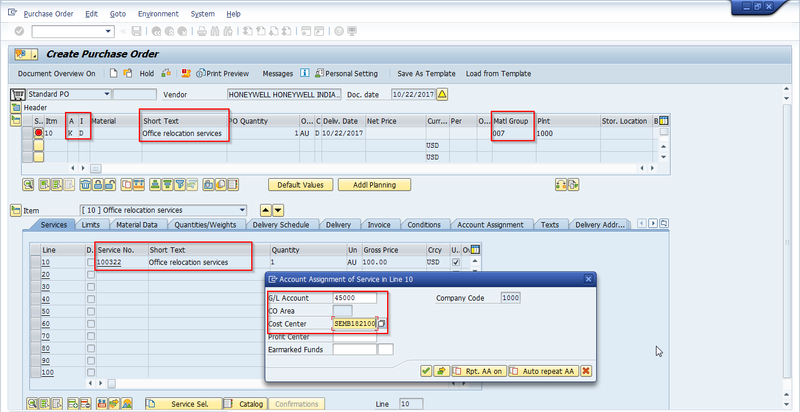 In item detail under services tab, service / activity number, short text, quantity, and price have to be maintained. There is another pop up requesting cost center and G/L account which is a result of account assignment category “K”. In item details there is Limits tab, which allows us to maintain overall limit for a purchase order or services. This limit fields are very helpful when unplanned services occur. Purchase order 4500020824 is created on saving the PO screen with the above details. When the external service provider delivers the services, they intimate the organization that the work is completed. This actual work done or service provided will need to be entered into the system. SAP service entry sheet helps the organization to record the work actually done or the service provided by the external service provider. 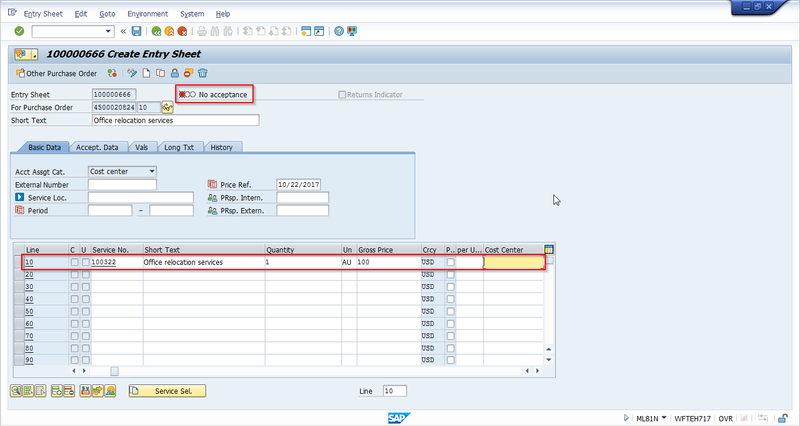 SAP service entry sheet involves a two-steps process: SAP service entry sheet creation and service acceptance. For better understanding, this two-steps process could be compared with a goods receipt against PO and quality inspection. When a material is procured and would need to be stocked in warehouse, first a Goods Receipt (GR) against PO is made, and if quality inspection had been activated for that material, the stock could be moved to unrestricted use in the warehouse only after quality clearance. So, goods receipt against PO is similar to SAP service entry sheet and quality clearance is similar to accepting a service entry. Planned services – These services could be copied into SAP service entry sheet from PO. Unplanned services – These services could be entered directly into SAP service entry sheet if any such services are provided. The cost incurred by the unplanned services should not exceed the limit set in the PO. Once the service entry sheet is created, the next step is to accept the service entry sheet and the recorded services. The relevant financial and cost accounting postings are not done until a service entry sheet is accepted. 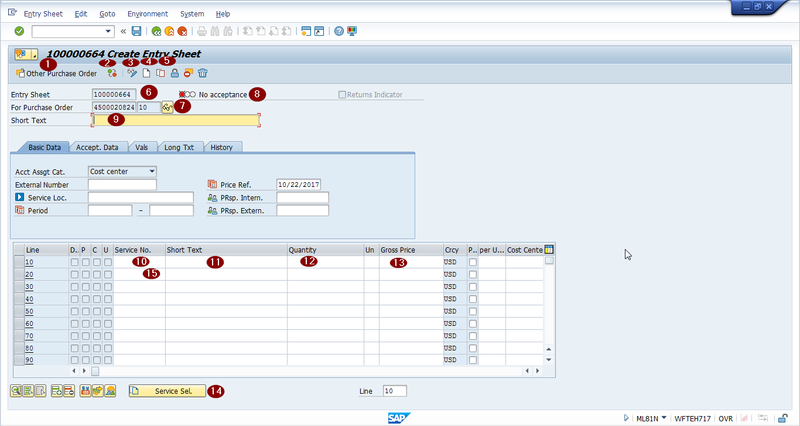 Release procedure could also be maintained in SAP service entry sheets for accepting. This will bring you to the below screen. Click on Other Purchase Order icon . 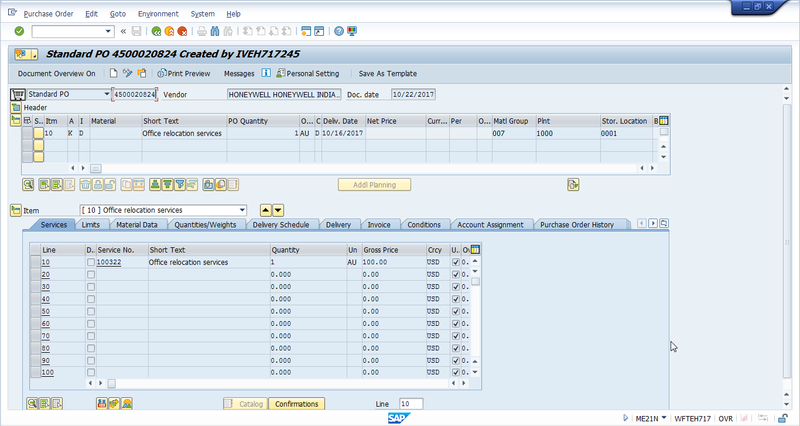 Other Purchase order – This icon helps to select the other Purchase Order number and create a new SAP service entry sheet. Tree On/Off – This icon helps in document overview tree. This will help in overview screen on/off. Display / Change – As ML81N is a single screen transaction this icon helps in display or change of service entry sheet. Create entry sheet – This icon helps in SAP service entry sheet creation. This is for a new service entry. Copy entry sheet – Service details from other sheet could be copied and entered into the new sheet. Entry Sheet – This field displays the entry sheet number, which would be updated in the purchase order history tab. For Purchase Order – This field displays the reference PO number for which service entry sheet is being created. Acceptance – The traffic signal like red, yellow and green are displayed over here, which shows that either no acceptance, will be accepted or accepted. Short Text – Short text describes the services rendered against the purchase order. Service Number – Service number / activity number to be entered from the service master record. Short Text – Short text from the service master record would be populated. Quantity – Quantity of the services rendered. Gross price – Price of the service that was accepted by both parties. Service selection – Services entered in the PO could be copied into this service entry sheet by clicking this icon and selecting the required services. Services – If there are any additional services or unplanned services, those items could be entered / recorded in these items. Click on the release icon . The acceptance indicator would change to “will be accepted” as shown in the next image. The accepted service entry sheet will be set to “will be accepted” acceptance indicator. This acceptance could be revoked with the help of icon. 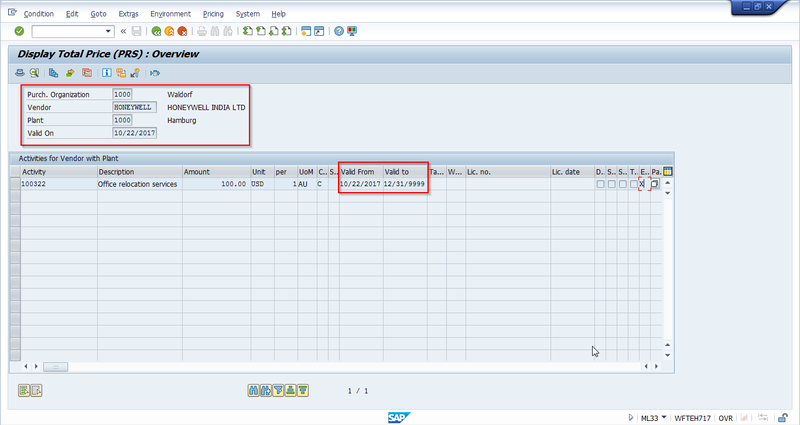 Now save the SAP service entry sheet, the acceptance indicator would be changed to “Accepted”. The financial and cost entries would be posted. How can a quantity be corrected if it was entered invalidly? Can it be edited, or deleted for reentry? How the credit memo scenario will come into picture with Services? 3. Create Credit Memo for Material return…what steps we follow for Service return or incomplete services. how do print out the service entry sheet in ML81N? In service entry sheet at the column of external number what mentioned. In ML81n—I need to break up a service GR into more than one line so that it can be charged to more than one cost center. Please advise.